After taking a semester of intermediate ceramics at the University of Missouri, I made the observation that painting and pottery were embedded in Mexican culture. Functional pots were integral to the survival of my ancestors and clay became a material for artistic expression. On the other hand, in Europe, painting is regarded as one of the highest forms of art and a painting is used as a representation of wealth. When the Spanish conquered Mexico an interesting mixture of both of the cultures took place. Traditional Mexican design made its way into the refined pottery used in Spain and the revolution of painting developed artists like Leonora Carrington, Frida Kahlo, Diego Rivera, David Alfaro Siqueiros, and many more. I had been trained as a painter for almost the entirety of my art career but when I began to throw on the wheel I felt a genuine connection to my Ancestors and their traditions. I decided to further my training in pottery at Access Arts with their Artist in Residence Program. There, I was surrounded by talented artists knowledgeable of the craft which helped me begin an honest conversation about my ceramic work. With the help of the organization, and my own research I was able to add a 3 dimensional aspect to my body of work that connected each piece. Towards the end of my last semester, at the University of Missouri, I won the grand prize in Artistic Expression for the Undergraduate Visual Arts and Design Showcase. With the prize money, I traveled to Italy and I attended a two-week painting workshop at the Florence Academy of Art, Italy. My artwork focuses on baroque classical paintings and learning the painting techniques used for the prominent works of that time period is incredibly important for the quality of my work. As I learned the traditional techniques to paint classical portraits, I had the opportunity to immerse myself in the culture and see the works of Caravaggio and Diego Velazquez; who inspired most of my work. 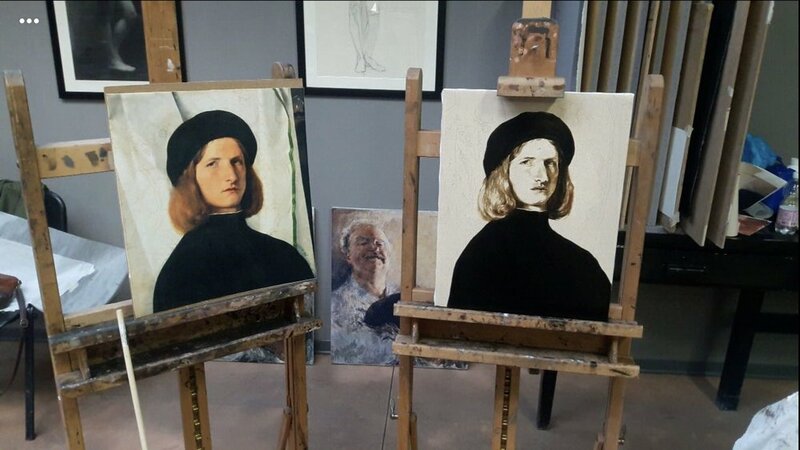 During the first week of the workshop, the first image I copied to learn the process in which the classical portraits were developed was Lorenzo Lotto's "Portrait of a Young Man with a Lamp". This image shows the piece in progress.